The installation of Dose in the prison chapel at HMP Holloway, which was at the centre of the 4-day workshop I participated in with Pharmacopeia, had three very particular and profound effects. 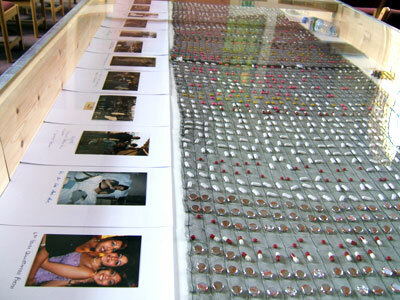 First, although I could only recognise some of the pills knitted into it like treasures, many of the prisoners could identify and name most of them – from aspirin to contraception to anti-psychotics – and some could directly read its narrative of erratic use of medication prior to a stay in Holloway to a controlled and helpful use afterwards. As an artwork it spoke directly to the prisoners and prompted immediate and lively discussion. Second, Dose became a work table, a place to gather round and talk, finding common ground in our experiences, and a space to map all of our lives. On day one we marked significant events on post-its and mapped a collective past. On day four when visitors came to our final exhibition we all contributed our hopes and predictions for our futures. This theme – of a life – carried through for those that were there on the first day into the two days we spent in the textiles room making bags – sewing, printing, chatting – around a table once again. Some women took pleasure in the gorgeous fabrics and ribbons Susie brought in and made something beautiful they could keep. One prisoner made a bag in turquoise satin with a print of a cat she had drawn to send to her daughter. Another materialised painful aspects of her past she found difficult to verbalise, with images of flames and the words ‘fire is powerful’. For me it was, perhaps, most moving to sew alongside a young prisoner who told me she was so quick to anger that she could never usually concentrate on anything. 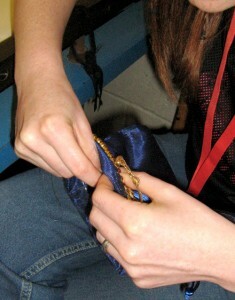 She astonished herself by working for two days solid, making a very intricate bag although she had never sewed before and was constantly frustrated. A gauze pocket at the front held drawings of scenes and memories that she took from a map of her life she had drawn on day one. That first morning the road that represented her life was marked by needles, alcohol and the death of her father and ended at ‘jail’. But then she added a future, beyond Holloway, which was going to be ‘Quality Street’. Her bag held the past and symbolised her hopes for the future in gold beads and ribbon. Dose mapped out a life in medications and brought difficult issues to the surface, but it also provided a structure for us all to think about our own lives, and in ways I never expected when I apprehensively stepped ‘inside’, to consider our commonalities even more than our differences.